This station is the center of the revolving white light which is beacon no. 33 on the Milwaukee to St. Paul-Minneapolis airway. The beacon is about 10 miles southeast of St. Paul, and about 1 mile northeast of Langdon. The station was not visited for a complete description. This beacon is not the same as beacon no. 33 observed in 1931. Station Recovery (1940) Recovery note by Soil Conservation Service 1940 the beacon tower does not show so good on photos, but the concrete direction arrow (not a north arrow) of airway route shows very plainly on photos. The picture point is the center of concrete arrow on ground. Center of arrow and base of tower is about 50 feet south of centerline of east-west road, 140 feet northwest of northwest corner of house, and is at north end of orchard. It is about 1 mile northeast of Langdon, Minn. Note--the number 37 in large numerals is painted on arrow. The U.S. Coast and Geodetic Survey might be in error by naming it beacon 33. Station Recovery (1996) Recovery note by Us Power Squadron 1996 mark not found. While we were on Arrow Quest 2017, Mary Devine from the Twin Cities Pioneer Press called and interviewed us about the arrows. 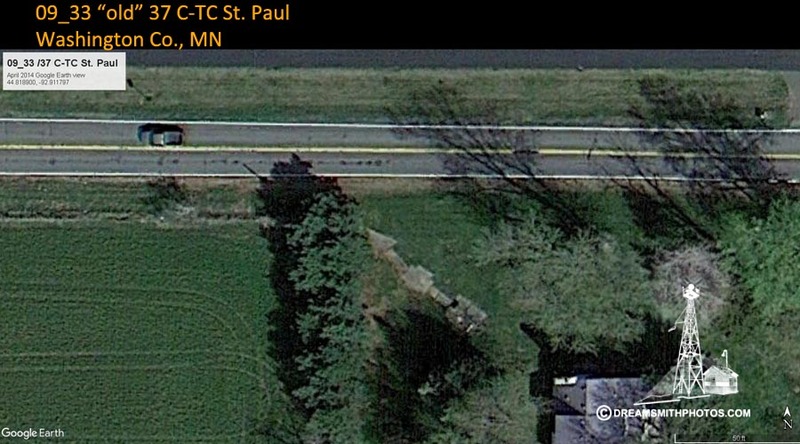 There are pictures of 33 "old" 37 C-TC St. Paul in the article.